I had spent a few hours crafting toddy and have made a few examples which I will either use for classes or for a display table. 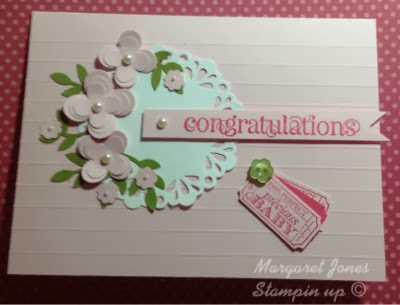 They all use stamps from the stampset See Ya Later which is part of sale a bration which you will be able to get FREE when you purchase at least £45 of product from a current catalogue from 28 January until end of March. If you would like to book a party during this period please get in contact either me. As you can see all the designs are very similar but by using a different stamp and a change of colours they can look very different. I hope that you all had a good Christmas and looking forward to 2014. Looking back 2013 was quite an eventful year. Our eldest daughter got married in August and more recently our nephew James and his wife Laura had a baby girl Nellie Rose and our son in laws sister Victoria had a baby boy Charlie Joseph. I wonder what 2014 has in store for us. 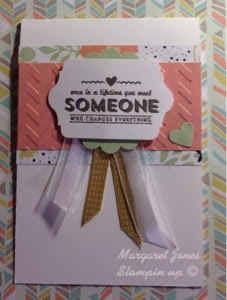 Today, I am sharing with you another card on the love theme. I have seen something similar on a Pinterest but I have made some alterations to it. 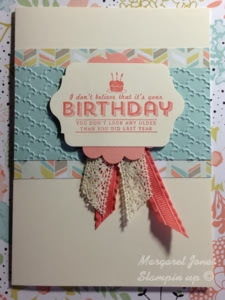 This uses one of the stampsets from sale a bration as well as the current in colours from Stampin up. I will be introducing two new campaigns for the new year. The first is titled 'New Year New Hobby ' and the second is 'New Year New Opportunities ' so please come back in a few days time when all will be revealed . I hope that you all had a lovely day yesterday and Santa visited you. I had a video camera from my hubbie which I had a little practice with it today. I got really frustrated as I could not get my practice video to transfer from the camcorder onto my ipad mini. After hours of trying I managed to do it ,I needed to alter the format of the video on the camcorder so that it was compatible with the ipad , but I had almost given up . Technology can sometimes be very annoying !! 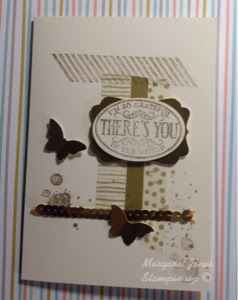 Today I am share with you a card using one of the stampsets from sale a bration which starts on 28 January. A really wet and windy day on the South coast today. I do hope that you all get about safely today. The Spring catalogue will be launched on 28 January and today I am sharing with you a card which uses products from the catalogue. 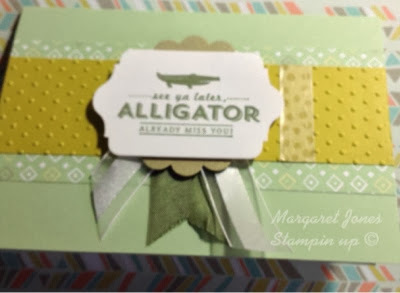 The trend next year is going to the use of lots of metallics and Stampin up have introduced several gold and silver products. All the items on this card are gold ,although some of look much darker in this photo. I hope that you are all ready for Christmas. I just have the last bit of shopping to collect tomorrow and I can then think about the good preparation. I think that I will make the dessert tomorrow, Black Forest trifle which we always have on Christmas Day. 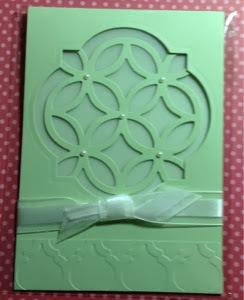 Today I a sharing with you a retro card which I have made from products from sale a bration which starts on 28 January. If you would like to receive a sale a bration catalogue please let me know and I will pop one in the post for you. Please come back tomorrow when I will show you a card which features gold . 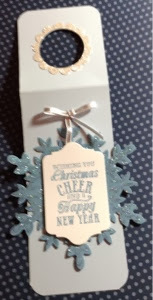 All the Christmas cards have been made and sent so now I have been able to find time to play with some of the products that a Stampin up will be introducing in 2014. On 28 January Sale a bration starts. This is a special time for Stampin up as you can get products for free, yes for free and we all like to get given something for nothing. For every £45 you spend on products you can choose a free gift. 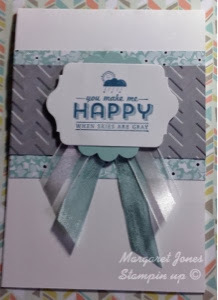 Today I am sharing with you a card that uses some of the free products. 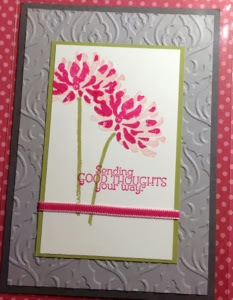 This card uses stampsets See Ya Later and Petal Parade as well as free Designer Series Paper Sweet Sorbet. It also uses a couple of items from the Spring mini catalogue which will also be starting at the end of January, more about that later. A dull and dismal day on the South Coast, but I have some good news. Our nephew James and his wife Laura had a baby girl yesterday . Nellie Rose arrived early yesterday to join little Isla just in time for Christmas. So luckily there will no frantic rush to the hospital over Christmas. 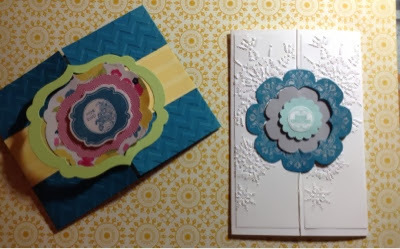 This is the card that I have made for them which has been cased from Zoe Tant. I hope that they don't see it on this blog but it may take several days to arrive with all the Christmas post. I really enjoyed this as it is different from my usual style. 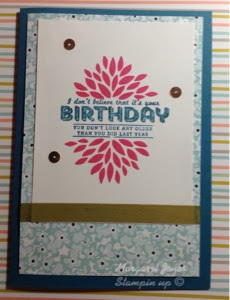 I love the scored lines across the card, I think that I will be using that idea in other projects. I am going to make some small crackers for table gifts for our Christmad Eve dinner with our family. Final Christmas cards I hope ! I do enjoy making Christmas cards but this year I seem to have loads and they keep getting used up by my lovely family and then I have to make another batch and a few spare just in case. This design ww as inspired by another project that I made for a class, a wine bottle tag. I the adapted it for a card. I have run out of the lovely silver ribbon. I have used 2 rolls on Christmas projects. So this was the wine bottle tag which I then CASED for this card. I do really like the Festive Flurry stampset and matching framelits. 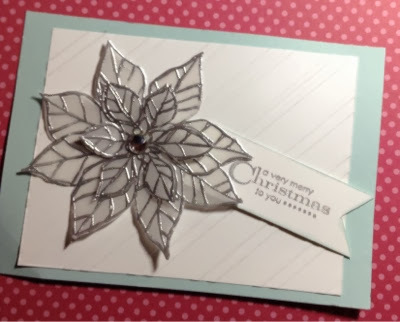 This was embossed with the heat and stick powder before adding Dazzling Diamonds so it is all sparkly. The Stampin up Clearance Rack has now gone live with lots of products on offer with a massive 80% off. 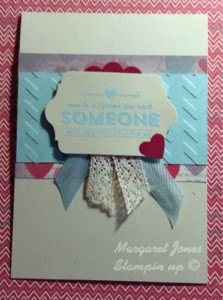 Once they are gone they are gone so don't hesitiate and go to www.margaretjones.stampinup.net to grab some of the offers before they disappear. Just popping by to let you know that a new Clearance Rack Blitz begins 10 December. Retired products—up to 80% off—will only be available while supplies last. We held our last all day class for this year yesterday at Valley Park Community Centre. We were joined by our regular group of ladies. We had demonstrations of all the projects, followed by a lovely warming lunch of pasta bake and salad, followed by lemon tart, mince pies, brownie and cream . We had all eaten so much that we felt like a sleep before we did the afternoon projects. 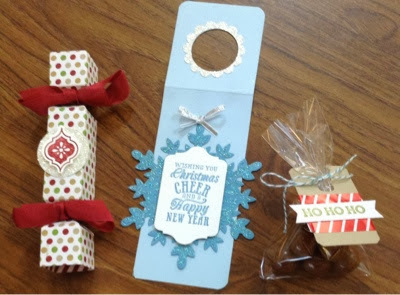 In the morning the ladies made a cracker, a wine bottle tag and a sweet treat. This is part of our display table to give the ladies some inspiration. 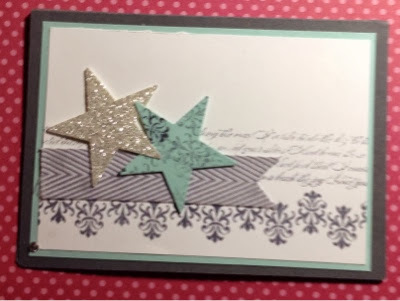 I forgot to take a phot of the afternoon project which was a lovely decoration using Festive Flurry , I will try to get a copy from Aly and post it later in the week. I am just finalising my projects for the craft class at Valley Park Community Centre on Saturday. This will be the last class for 2013 and some of our ladies have been enquiring about the dates for 2014 which I have listed below. 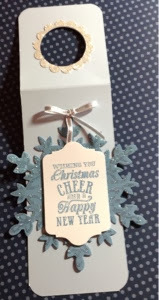 This months class includes projects related to Christmas including a cracker made with the great Envelope Punch Board which Stampin up have introduced as well as gifts for your Christmas table and lots of other beautiful handmade projects. Put this on over a bottle of wine to jazz up your offering for a party. All classes are held on Saturdays from 10 - 4 and cost £25 or £20 with early bird booking. 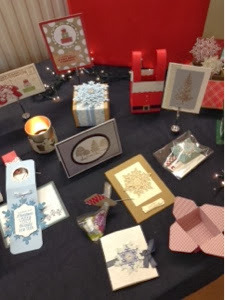 Last week I held my last Christmas card class in Bishops Waltham. 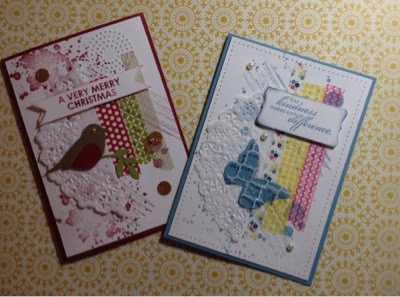 As with last months class I designed cards which used the same designs , the same stampsets but one design was Christmas based and the other a different occasion card. These gatefold cards used a linking mechanism where half the design is on one side of the card and the other half on the other side. 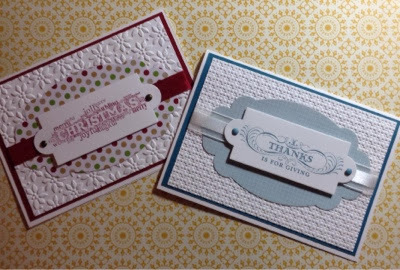 These cards both use the stampset Seasonal Sayings, but used different embossing folders and colours. 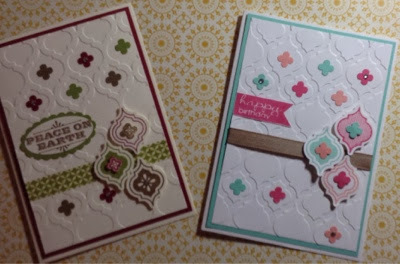 These both use the lovely stampset Mosaic Madness. Using different colours make them look so different. Finally, these cards were CASED from a card that was demonstrated at convention. 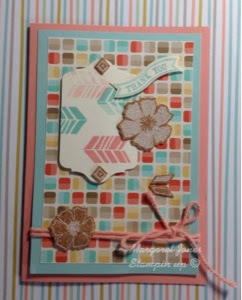 They both used the stampset Gorgeous Grunge, washi tape and part of a doily. 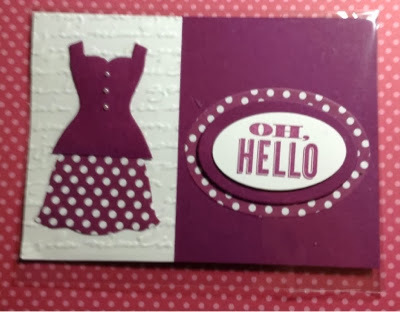 I recently attended my second Stampin up convention. 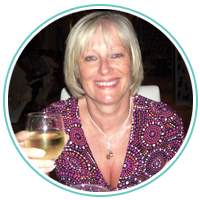 This years convention was held in Manchester and we had a weekend full of fun, good ideas for crafting and some great classes for how to grow your business. And just to finish off here is a photo of some of the ladies I was with in the event booth. We had such fun in there. I am at the front , on the left with the top hat and glasses. The first day of December ! Have you opened your advent calendar yet or have you eaten all 24 of the chocolates already ? 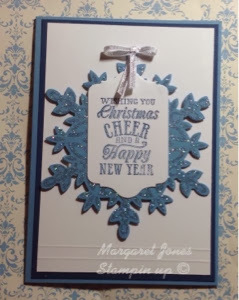 I am really behind with making my Christmas cards this year and as I have previously made all my cards for the last 4 years it is expected now from some of my friends and they often comment on how nice it is to receive a home made card, so I will be up in my craft room later making as many as I can. 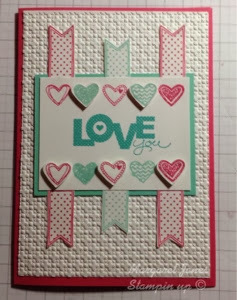 Today Stampin up have introduced a new offer " A whole lot of Love " . These are products for Valentines day so that we can be prepared in time. They include some beautiful stampsets, treat bags and note lets. For the little ones there are lovely monster shaped cards for both boys and girls. My favourite is the lovely ornate heart - Flowerfull hearty stamp which I definitely will be using. The offer lasts from 1 December to 27 January , so get yours whilst stocks last , because once they are gone they are not restocked. If you would to purchase any of these items please click on shop now in the right hand bar on my blog to take you to my shop site.